Map of Dry Creek Courtesy United Properties. A home remodeler has found itself a new place near Denver. Power Home Remodeling Group signed on for 23,600 square feet of space at INOVA Flex, a new 70,000-square-foot building soon to break ground in Centennial. It’s the first lease for the building, which will be part of a 650,000-square-foot office, flex and residential complex owned by United Properties and Principal Real Estate Investors. The Pennsylvania-based company chose the building after scanning the metro area for a space with a high level of office finishes, a loading dock and plenty of parking, said Andrew Blaustein, the Newmark Grubb Knight Frank broker who handled the search. Power Home Remodeling installs windows, siding, roofs and other home-building pieces. Its new Denver location will be a distribution hub of sorts. Manufactured-home products will come into the location in bulk before being sorted out and sent to individual job sites in the area. About 20 Power Home Remodeling employees from outside of Denver will relocate to start up the shop, which eventually will grow to a staff of 100. The company is also expanding in the Midwest, and just leased 31,000 square feet for a new location in Chicago, according to Crain’s Chicago Business. But before running home remodeling products through Denver, Power Home Remodeling needs its own home. The building is slated to break ground in June. Assuming construction runs on schedule, Power Home Remodeling will move in early next year. Murray and Stafford is the general contractor on the INOVA Flex building. 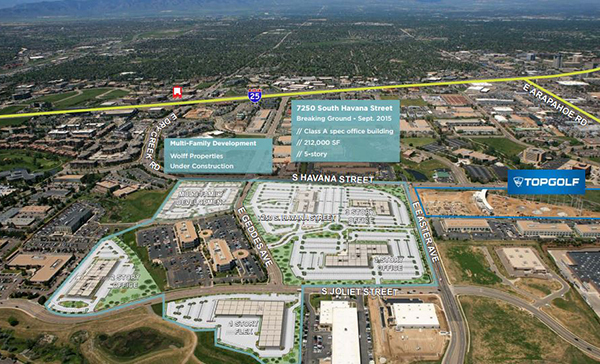 INOVA Flex is part of a 58-acre INOVA Dry Creek office park that United Properties is planning at the corner of Havana Street and Easter Avenue, across the street from the Centennial Top Golf complex. United Properties and Principal Real Estate Investors bought the then-undeveloped site last year for $8.2 million. Since then, the two companies have broken ground on a five-story, 212,000-square-foot office building at 7250 S. Havana St. United Properties and Principal Real Estate Investors also sold about 8.5 acres at Dry Creek to Wolff Co. last year, where Wolff is now building 285 apartments. Plans for the 58-acre project call for a pair of three-story office buildings and another of two stories. Newmark Grubb Knight Frank brokers Dave Lee, Jason Addlesperger and Mike Wafer are in charge of leasing at INOVA. The same trio brokered the Power Home Remodeling lease for the landlords.